I like making overnight oats because they are delicious and healthy, and they are one of the only meals I can make myself in my dorm room. The only appliance you need to make them is a fridge, and some of the ingredients are available in the dining hall. Hence, perfect dorm-room food. They are easy to prepare, and you can get creative with the quantities and types of ingredients. No matter how creative you get, they will still *almost* always turn out edible. My boyfriend calls overnight oats ‘baby-food’ and my sister calls them ‘mush’. I’ll admit that overnight oats don’t look especially appealing, but even the boyfriend and sister agree that they are awesome. 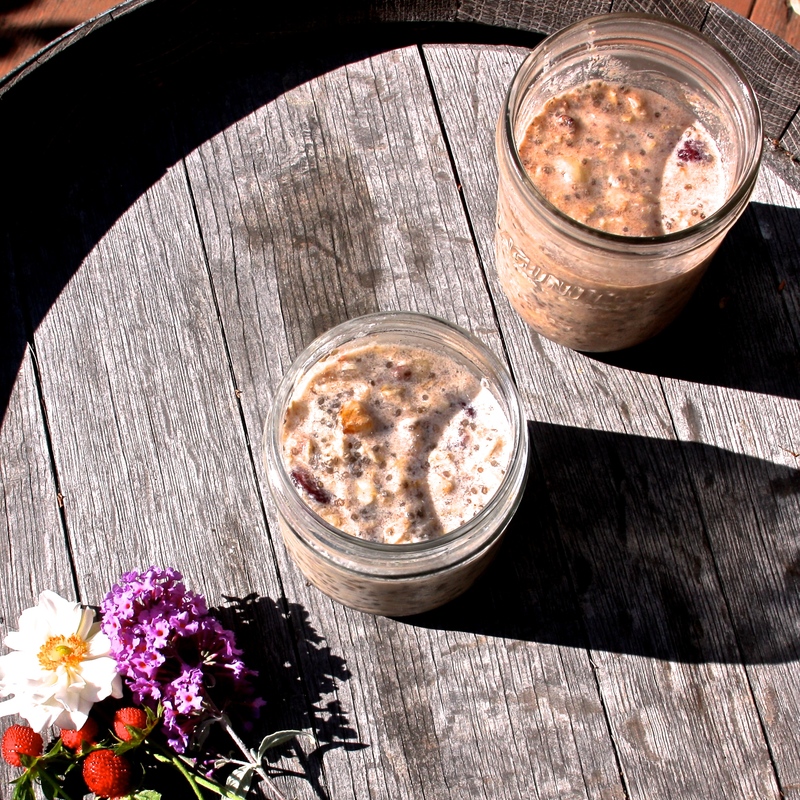 So what the heck are overnight oats? They’re just like oatmeal, but instead of cooking the oatmeal in hot water or milk, you soak the oats in cold water or milk. They need to soak for at least a couple of hours; I usually make them the night before and let them sit overnight. You could make overnight oats with just rolled oats and milk, but I like to add a few more ingredients to up the deliciousness factor. One of these ingredients is chia seeds. They’re not strictly necessary, but I always use chia seeds because they add so much. They make the overnight oats seem creamy. Chia seeds are the same seeds you might have used to grow a chia pet when you were little; you can buy them from most grocery stores (probably in the health food section). They soak up about four times their volume in liquid. They don’t add much flavor, but they add to the texture of the oats. I also always add banana. I usually mash half a banana per serving. The banana and chia seeds work really well together to give the oats a nice consistency. 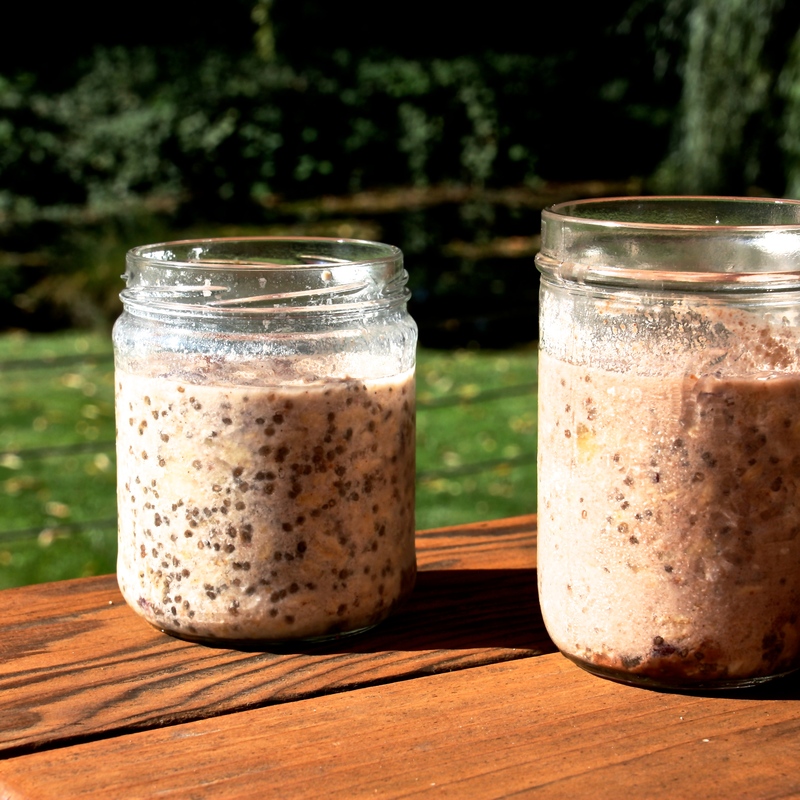 I use a mason jar to combine the ingredients because I like how it looks, and it comes with a lid; but any cup or bowl will work, just put saran-wrap on top when you soak the oats. Mash ½ banana in mason jar, cup, or bowl. Add remaining ingredients (oats, chia seeds, almond milk, nuts, and dried fruit), stir, and refrigerate for anywhere between 2 hours and 2 days. Try adding other spices. I like nutmeg and cardamom. Add honey, nut butters, or Nutella. Best to stir these in with the banana and spices before adding other ingredients. 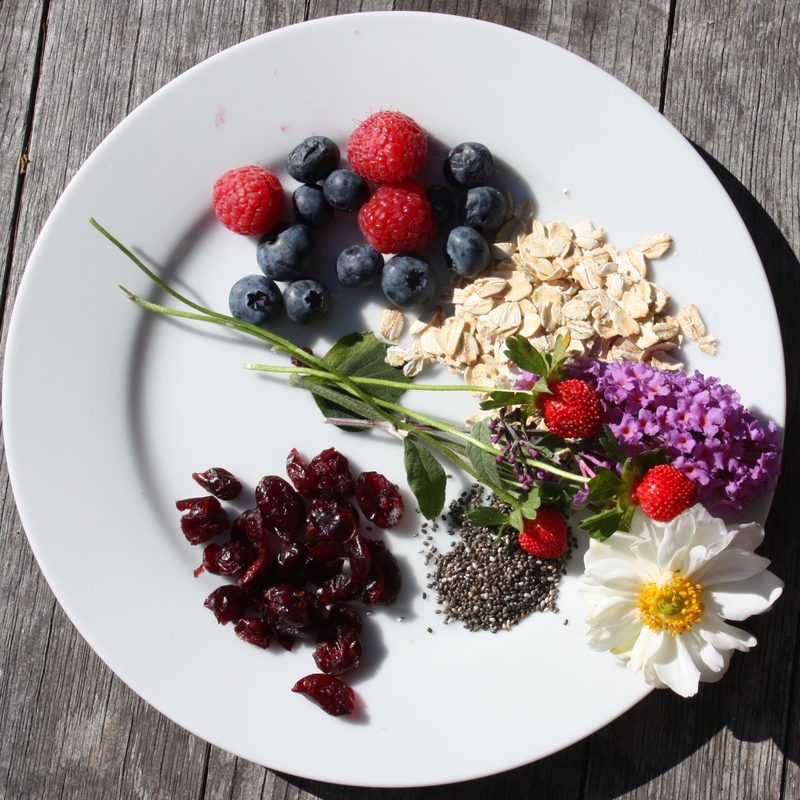 Add fresh fruit to the oats right before eating. I find that fresh fruit loses its flavor if you add it before refrigerating. Microwave the oats before eating if it’s chilly outside. I made two variations this time around: cinnamon cranberry walnut (left), and cranberry chocolate macadamia nut (right). Both tasty, but the taste-testers and I agreed that the cinnamon cranberry walnut was better.